It's been a while since we've had a giveaway, huh? Today, I'm pleased to introduce you to Minmac, an etsy shop that sells fun jewelry that is so easy to style and add a bit of color to your outfit with. I like the keyrings, pendants etc with the personalised maps on them best - I'd choose a map showing the top of the mountain my husband and I met on. Jessica Chan: I like thePink Flower Fabric Earrings, they're just darling! I love that she has so many post-back earrings; they're the only kind I can wear! I like so many, but I gotta say - the Little Mermaid ones are pretty great! Those anchor earrings and chevron earrings are great! Plus I'm loving that city necklace, maybe with Sacramento, my home town, or San Fran, one of my favorite cities. Fun giveaway! Thanks for hosting. I love the Green and White Lace St. Patrick's Day Pendant! 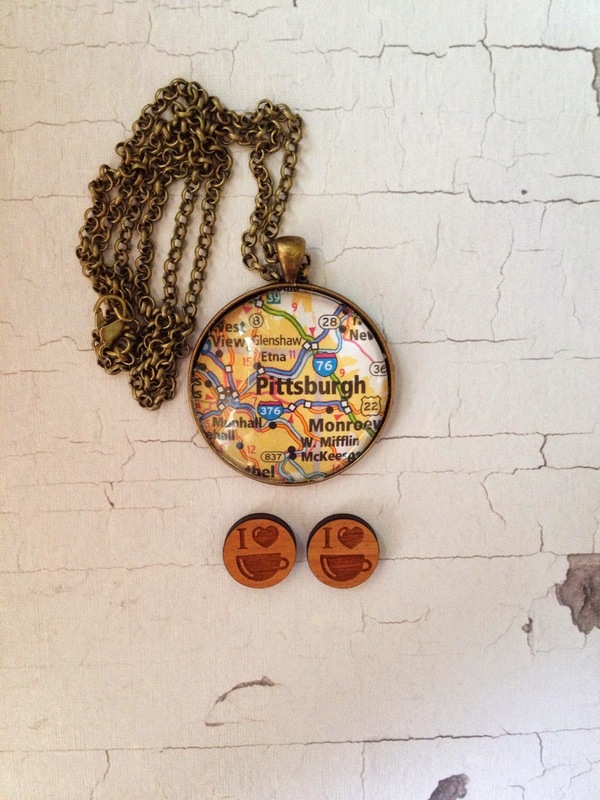 I love the map necklace. Awesome giveaway! The navy blue fabric earrings! I love the turquoise and white flower earrings!! Too cute. I love the navy and white anchor earrings!!!!! I Love the Chevron necklace. I just Love anything Chevron and my daughters birthday is July 23th and this would be a great present for her. I love the state love keychain!